After 6 years, it was time to retire the old 18' x 52" Intex pool and get another. I replaced the liner once during that time (mainly due to neglect and poor maintenance) and the frame was rusting now (Southwest Louisiana), but it wasn't as bad as I thought. So the new pool came with 2 inlets and no skimmer. I'm thinking of putting the in-wall skimmer in this one as well, but I'm not sure how to plug off one of the holes. 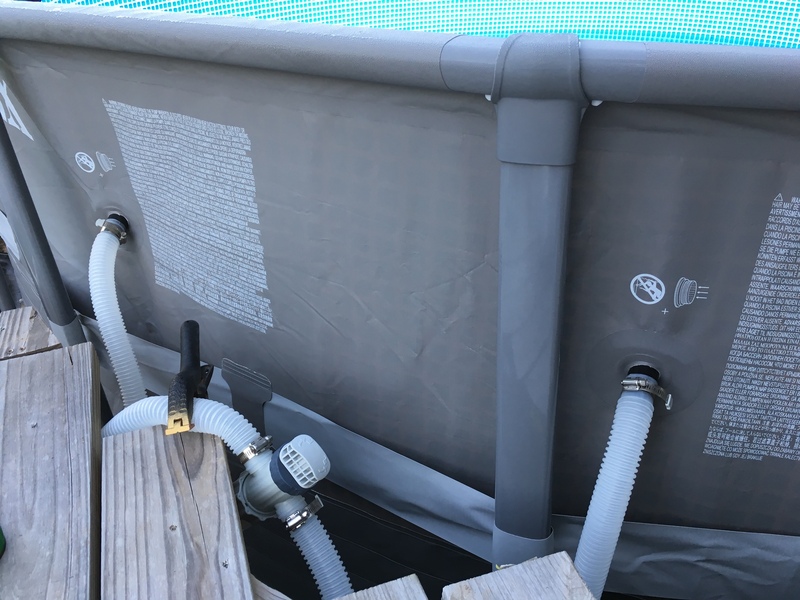 Has anyone made modifications to this 2 inlet pool, and if so, do you have pictures? Thanks in advance. I know I've seen threads about this exact topic before. As I recall, the second suction line gets converted to a second return. Thanks! I had checked out that thread. I did a search but didn't come up with what I was looking for, probably searching for the wrong terms. I know someone has already dealt with this and I can't be the only one. Thanks again! Thanks for that one! Lots of info! I use the black plug one one. It's just there doing nothing, except plugging the precut hole in the pool. Then one hose stays hooked up to the other (which is also plugged) so 100% of the water goes through the skimmer. I found using inlet plus the skimmer didn't work so well. Plugging them both allows great flow through the skimmer. Plus, it was cheap, no special parts needed, except a new skimmer adaptor to work with the 1 1/4 hose. Thanks! I seem to only have one plug though. I'll have to look into getting another one. I assume you have an in-wall skimmer, correct? I added a skimmer and opened up both of the intex inlets to 1.5 inches and added Hayward through the wall fittings. There are many examples on here. I just plugged both of mine with the black plugs and left the hoses and T connected after installing the skimmer. Looks kinda blah just having two hoses hanging there doing nothing but Im cheap and dont want to spend the money to do anything else.